Recognizing that we needed to establish a Scholarship Committee, we asked our classmates to let us know if they were interested in serving on it. Our Scholarship Committee is currently comprised of Wendy Olmstead Worley, Susan Hildreth Silver, and Tom Cross. The Committee immediately set to work establishing the criteria that a student would need to meet in order to earn the scholarship. Our Committee contacts Keene High School to receive the applications. After careful consideration of the applicants, our Committee selects the recipient. We are proud of the following recipients of our Scholarship!!! The recipient of our 2018 Scholarship is Jax (Jacqueline) Perry. Jax is attending Connecticut College. She plans to study Neuroscience and Studio Arts. After 11 years of dance, Jax had 5 surgeries to repair her ankles from the damage this caused. Due to these surgeries she had to miss a great deal of school in her freshman and sophomore years. Despite this, her grades did not suffer and she was in many AP classes. To manage her pain and channel her creative side, Jax moved her focus to art. She excelled here also and has received numerous awards. The scholarship committee is so delighted to let everyone know who we chose for our Roger Murphy Class of 1971 KHS Scholarship for the 2017-2018 college year. Since Roger's donation to our class scholarship fund was very generous, we decided it was only fitting to name the scholarship in his name for the years to come. Emma Priebe exhibited all of the qualities of an all around student, the qualities we look for to receive our scholarship. She was ranked 41 amongst her peers in her graduating class, she was involved in extra curricular activities while working as a babysitter, waitress, and ward aid. She enrolled in a two-year program offered through the Chesire Career Center at KHS to pursue earning her LNA. She is an avid equestrian and involved in 4-H. She was a Big Sister with Big Brothers and Big Sisters. She is contributing to her college fund by saving the money she earned while working. She was accepted to Colby Sawyer College where she will pursue a nursing degree. Roger Murphy's mother and nephew were present at the awards evening at KHS to see Emma receive the scholarship which Roger's nephew, Gordon Daniels, presented to Emma. Congratulations to Emma for all of her past and future successes in attaining her hearts' desires and goals. December 2016 Notation - In October 2016, KHS '71 received a $2,500 donation from classmate Roger Murphy for the purpose of funding the scholarship for the next five awards. Because of his generosity, we have renamed our scholarship the Keene High School Class of 1971 Roger J. Murphy Memorial Scholarship and it will remain that way until after the 2021 scholarship has been awarded to the deserving KHS senior. Sadly, Roger passed away on November 30, 2016. Our 5th scholarship went to Elizabeth Best. She had a very rough road her first year at KHS, but pulled up her grades in spite of much turmoil in her life. She decided to make a difference in her life even though those who were supposed to support to her were not. Tom Cross saw a diamond in the rough and pushed the committee to choose her over two other equally stellar candidates. Elizabeth is going to Westfield State University and is studying to be a teacher. Please keep her in your thoughts and prayers as she heals from one more hurdle in her life, a neck injury while cheering. Thank you to all who have donated in order to continue this scholarship every year. We have had donations large and small. All of them made a huge difference in the lives of those students we have chosen and will continue to choose. Susan Hildreth Silver, Tom Cross, and Wendy Olmstead Worley chose our 4th candidate for our KHS Class of 1971 scholarship. Susan gave out the scholarship for $500 at the KHS awards ceremony on June 10, 2015. The recipient was Kayla Truman. Kayla met all of the criteria: B average student, engaged in extracurricular activities, a young lady of good character, a great essay, and she was involved in community service. She was at work every morning at 6:45am opening the infant and toddler room at KHS, worked every day after school at the YMCA Learning Center as an assistant preschool teacher and worked at a local grocery store. She received stellar references from the early childhood teacher at KHS, the director of the Learning Center, and her school counselor at KHS. Some of the comments to describe Kayla were patient, caring, respectful, a positive role model, great work ethics, always ready to learn, a hard worker, and a natural leader. Kayla will be attending River Valley Community College to pursue an Associates degree in Early Childhood education. Her ultimate goal is to own and operate her own preschool. Tim Carbone presented our third annual KHS Class of '71 Scholarship award to Mackenzie Tucker from Keene. She is ranked 15 in her graduating class, played varsity basketball, lacrosse, volleyball, and bowling. She volunteers at her church and in the community, works, and maintains friendships. She was stricken with a debilitating disease in 5th grade called Perthis Disease. She was on crutches all through middle school. As a freshman in high school, she was able to get rid of her crutches and she took off running. Much to her parents' hesitation, Mackenzie played sports and excelled in many. She has also had perfect attendance for the last 6 years of school. She graduated with a LNA license due to all of the necessary health courses she has taken. Her college aspiration is to become a radiologic technician. She has been accepted to Quinnipiac University, NH Technological Institute, and Massachusetts College of Pharmacy and Health Sciences University, where she has received generous scholarships. At the time of her application, she had not decided on which college to attend. Please say a prayer for Mackenzie for safety, stamina, and drive to continue on her path to success. On June 17, 2013, Tim Carbone presented our second annual KHS Class of '71 Scholarship to Hanah Conlan from Keene. Hanah will be the first one in her family to attend college. Her goal is to become a pediatric psychologist. She will attend West Virginia University beginning in the Fall of 2013. Congratulations to Hanah for her hard work in school, sports, and her community! 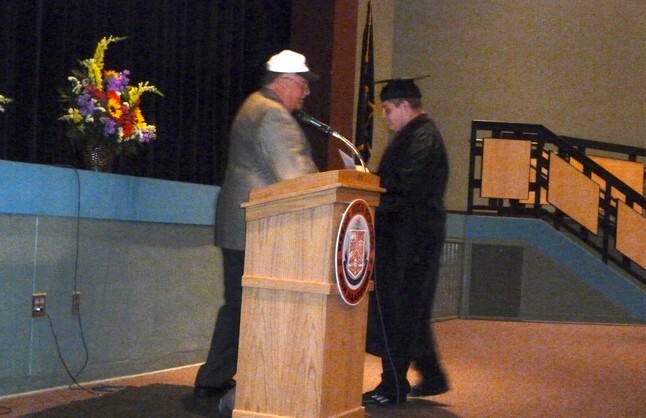 On June 13, 2012, Tim Carbone presented Jacob Blake with the 2012 KHS Class of '71 Scholarship. 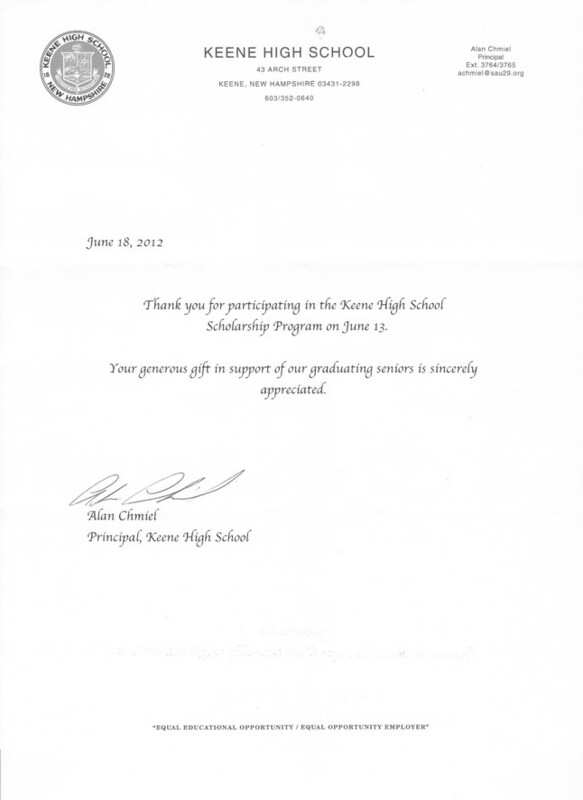 We received the following thank you letter from Keene High School. And, you can read about Jacob's story below. "The scholarship committee has picked its first recipient for the Class of 1971 scholarship. His name is Jacob Blake. Jacob is attending SUNY Cobleskill in the Fall. His plan of study is to become a Dairy Farmer. He will get his associates degree and then switch in to a bachelor's program to attain his degree in Animal Science, His Mom passed away last Fall. With going through such a tragedy for a young man, Jacob has attained a 3.1 GPA, volunteered in his community, won the National Achievement Award for the past two years through 4H, worked at several fairs and Applewood nursing home, works over 80 hours on a local farm, and is 4H Club president for 3 years and treasurer for 1 year. While in Future Farmers of America, Jacob placed first at the state dairy showmanship competition at UNH and was rewarded by being chosen to compete at the national level in Indiana. Due to his Mom passing away, he could not push himself to go. He also has financial need. He will be paying for his college with a Pell Grant and working this summer and during college. Jacob has had a difficult Senior year with the passing of his Mom and the fact "she will not see him graduate or go on to college." If anyone can attend the awards ceremony, it would be great support for Jacob to let him know how proud we are of him. Jacob will be receiving $500.00 from our class. It would be great if we could give him more, but at this point it is all we have to give and still have a buffer in our account. Please send in your dues so we are able to keep this scholarship going from year to year. If anyone would like to donate more than the yearly dues, we would welcome it with open hand."